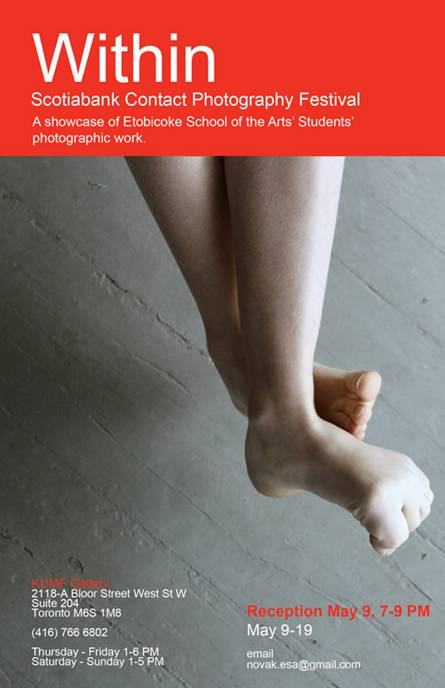 Etobicoke School of the Arts’s (ESA) Visual Art and Photography Department will be having its second exhibition with Scotiabank CONTACT Photography. “Within,” at KUMF Gallery, will showcase the work of our grade 12 students. Using digital and film-based photography, each artist’s process is personal, thoughtful, and often full of risks. This collection of contemporary art embodies student voices and provides viewers with a glimpse into the lived experience of this group of young artists. Photography curated by Glenn Novak.